The media of India today has become an industry selling the news and satisfying the advertisers, who are filling its coffers. Thus we need to strengthen the Press Council of India as a disciplinary authority with punishing powers. 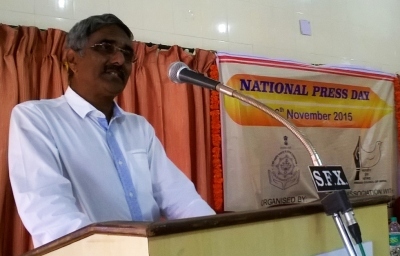 Adv Cleofato Almeida Coutinho, Goa’s constitutional expert and a renowned columnist, unfolded the threats the ethical media is facing today, while ‘Mirroring the Media’ at the National Press Day function held today in Panaji. The function was jointly organised by Goa government and journalists’ bodies, observing foundation day of the PCI. Adv Coutinho also felt finding a formula to deliver news to the people at a cheaper rate without bothering about advertising revenue is a distant reality. While speaking mainly about the scenario of national media, Adv Coutinho gave an example of one media baron who told its editors that they are in advertising business and the news should cater to their consumers, not the general public. Poverty, hardships, exploitation, farmers’ suicides are not the issues the media today considers to showcase but merely report and leave at that. “The prime focus is on Feel Good News under the pressure of advertisers; not taking up the real issues confronting the Indian society”, said Adv Coutinho. On the other hand, he said 2009 elections witnessed Paid News phenomenon while 2014 elections were dominated by big business houses buying media houses and fully controlling the news. “While one party was given three fourth space, the rest of the parties were left with only one fourth space. How do you balance the media equilibrium with such a scenario”, he asked. In recently held Bihar elections, he said one TV channel suppressed its own survey report and projected some fictional figures which could satisfy their masters, claimed Adv Coutinho. In spite of all such violations, the Press Council of India could do nothing since it has no powers to deal with such situations. “Merely a recommendatory body, PCI’s directions are either not accepted or completely violated”, he observed. Justice M Katju tried to bring some life in PCI, especially on the Paid News scenario but within limitations, he said. Adv Coutinho thus felt that the PCI needs to be strengthened further by making it a body of journalists, with punishing powers while considering Paid News as an extortion business, punishable under the Indian Penal Code. Claiming that digital media is effective only among 10 per cent population of India, he predicted that the print media in India would collapse only by 2040, unlike the speedy erosion of print media industry in the USA.